On June 22nd my wife and I put my new trail camera in a bedding area off of a bean field. I always put my cameras around summer food sources because deer are concentrated there at this time of year. On June 27th I checked my camera and had over 200 hundred pictures. I had just purchased the new Moultrie 4.0 and I was excited to see what the pictures looked like and what type of bucks were in the area. I was about half way through and had some pictures of does and smaller bucks when all of a sudden this giant non-typical was in front of my camera. Living where there is heavy hunting pressure and a poorly managed deer herd, I was in shock. I could not get to Wal-Mart fast enough and start printing pictures. I had over 20 pictures of this deer. From that point on my wife Jackie, my buddy Mike Wasik and I dedicated our season to this deer. We already had spots set up around bedding areas, and funnels between the bedding areas. Now the waiting game began. I pulled my camera and did not put it back there until the end of July under an apple tree. After three days I took my camera out of the area and rushed home to view the pictures. There were over 300 pictures on the card. Going through the first 200 pictures there were some does and a few nice bucks. Scanning through the rest of the pictures, I began to worry that we were never going to get another velvet picture of the buck. Near the end of the pictures, my heart began to race. You could see a giant rack peeking out from behind a tree. 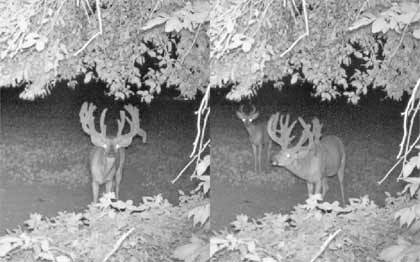 As my heart raced even faster, I continued to scan through the rest of the pictures and was amazed to get seven more pictures from all different angles of the giant buck. He had exploded into a 200 inch plus non-typical. The first time we hunted this area was November 1st with no sightings of any deer. After sitting all day in different stands based on wind directions, my wife and I saw a few smaller bucks, but no signs of the big one. It was not until the afternoon of November 8th that I finally saw the giant buck. He was on a doe at 45 yards and never stopped for a shot. Although my heart sank at not being able to get a shot, I was excited that I had at least seen him during the daylight. I continued hunting for him with no more sightings during bow season. Not being much of a gun hunter and having a month long gun season I was not going to hunt him hard until late muzzleloader season when he might make the mistake of feeding during daylight. On Tuesday November 20th, with gun season in full swing, I decided to hunt a wheat field hoping to shoot a doe. I was in stand for about two hours when I saw a doe coming out of the thicket heading for the wheat field. Preparing for the shot, I caught some movement behind her and noticed a drop-tine... It was him! I could not believe it! With my heart pounding in my chest, I cocked my hammer on my Thompson Center Prohunter and fired. The shot was only 30 yards, but with all the smoke I did not know what happened. When the smoke cleared I saw him lying there thrashing around. Being cold and excited it seemed like forever for me to reload. I shot him again and it was all over. After climbing down and examining the deer, my first shot hit him in the spine. I got very lucky. The buck that I had spent months dreaming about was now in my hands. After spending countless hours in the stand while bowhunting to then shoot him while muzzleloading for a doe still runs chills down my spine. This is one hunt that I will relive over and over for the rest of my life. Keith’s Niagara County buck has an official non-typical Boone & Crockett score of 221”. 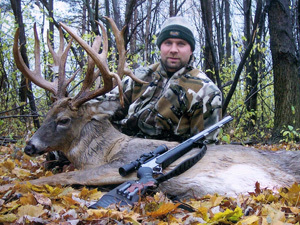 It is the number one non-typical whitetail taken with a muzzleloader in New York State and the largest whitetail taken in the North East during the 2009 season. Keith’s buck was mounted by Jim Block and Charlie Jaenecke at "The Buck Stops Here!" taxidermy studio in Pendelton, New York.